From June 5th to June 7th, Mary and I spent a long, hot, tiring but very educational weekend with the Arkansas Canoe Club’s School of River Paddling, The class takes place each year on the Spring River. 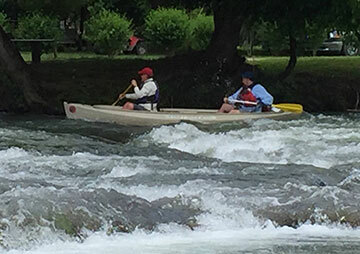 We attended the Tandem Canoe Class but they also offer, Solo Canoe and Kayak. It was definitely time well spent. There were 3 student canoes (6 students) and four instructors in our class. We thought this was a kind of high ratio but it was actually perfect. We got a lot of hands on instruction from some very patient and very knowledgeable folks. Going over all the basic bow and stern strokes and when to use them. We learned how to work together using complimentary strokes to really make the boat go where we want it too. If you don't know what a sweep, draw, pry, cross draw or brace is, you should definitely take this class. We also learned how simply leaning one way or the other can control the boat. More importantly, we learned which way to NEVER lean. If you want to know, take the class! We learned how to take an eddy, how to peel out of an eddy. We learned what an eddy is, how to identify it and why you would want to go into one in the first place. We learned techniques for paddling straight (which is one of the most difficult skills). We learned strategies for navigating rivers, how to identify good routes and how to safely avoid obstacles. We learned what do in the event that we end up IN the river instead of ON the river. We also learned some fun ways to play when you find some swifter moving water. 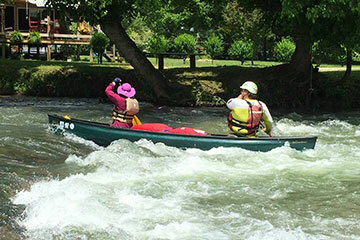 If you didn't know that you could face your boat upstream in certain types of fast moving water and hold it in place with very little effort, then you need to take the class! We cannot recommend the class highly enough for new boaters or just boaters that want to brush up on their skills. We are far from experts now, but at least know the right way to do things and we just need to keep working on them. Check the Arkansas Canoe Club web site for next years class schedule. It will be around the first weekend of June.